Space hackers prepare to reboot 35-year-old spacecraft #space « Adafruit Industries – Makers, hackers, artists, designers and engineers! IEEE spectrum has the incredible story on how a group of hackers are planning to try to communicate with a 35-year-old spacecraft. Early next week, a team of volunteers will use the Arecibo Observatory in Puerto Rico to see if they can make contact with a spacecraft that hasn’t fired its thrusters since 1987. If all goes well, the effort could bring the 35-year-old spacecraft, the International Sun-Earth Explorer 3 (ISEE-3), back into position near the Earth, where it could once again study the effect of solar weather on Earth’s magnetosphere. It will be a race against time. ISEE-3, which is transmitting two carrier signals, only came into hearing range a couple of months ago. Dennis Wingo, CEO of California-based Skycorp Incorporated, and his colleagues reckon ISEE-3 still has enough fuel to make it back to its original orbit at the Lagrangian point L1, at a spot between the sun and the Earth where a spacecraft can stay in sync with Earth’s orbit. But to make it, Wingo says, the spacecraft must be commanded to fire its thrusters by mid-June. And that’s far easier said than done. 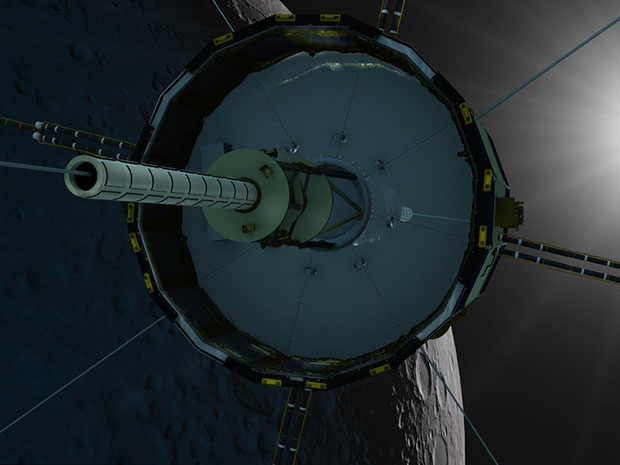 NASA no longer has the hardware to communicate with the ISEE-3. So in April, Wingo and Keith Cowing, a former NASA employee and editor of the websites NASAWatch and SpaceRef, started a (still-running) crowdfunding campaign on RocketHub to develop what they need to communicate and control the spacecraft: signal modulators and demodulators, transmitters, and a software-based mission control console to monitor the spacecraft’s propulsion and attitude control systems. Building all of this even 10 years ago “would have been impossible,” Wingo says. But with the advance of embedded systems technology, the team can construct radio components in software and debug them on aggressive timescales without breaking the bank.